Independent Travelers – A Trip to Grottaferrata and Ostia Antica, Italy… Where? We were visiting Frascati a few years back and some “locals” recommended a restaurant in nearby Grottaferrata… we were actually staying at their hotel but they insisted we go to another place for a dining experience. They told us it was excellent, featuring authentic regional food – they even booked the reservation for us. So how do you refuse three guys in suits on an elevator in Frascati? So we went! Years later we were passing through the Rome area and so begins another adventure of inspired travel itineraries. We arrived at Rome’s Fiumicino Airport (aka Leonardo da Vinci Airport) late in the day with plans to stay in the area for one night before heading out on a road trip through Italy. There are a few options to consider… go into Rome via a one hour plus taxi ride, staying at the airport Hilton Hotel (the only hotel at the airport) or getting a rental car and staying at a hotel just outside the airport area. We opted to get our rental car and begin our road trip with a side trip to a special place. 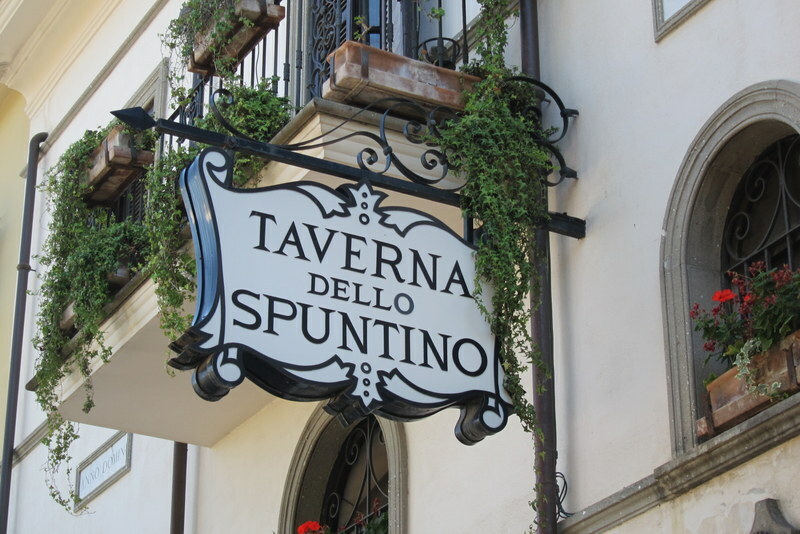 Less than thirty minutes from Fiumicino is the restaurant “Taverna dello Spuntino” which we enjoyed on that earlier trip to Frascati and vowed to return to after an amazing culinary experience. The restaurant is located within the hotel “Locanda dello Spuntino” and we choose to stay at this gem of an inn for our first night back in Italy. 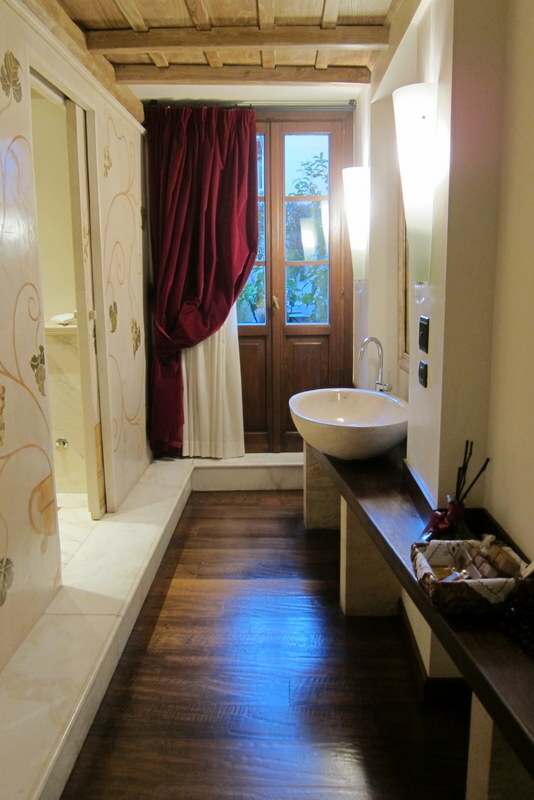 This boutique Inn was recently restored with loving hands and extremely skilled craftsmen. There are ten unique rooms so please go to their webpage for more details and book early, as they are popular! The restaurant once again was a gastronomic delight and the hotel surpassed our expectations. Grottaferrata dates back to 1004 with the Basilian Monastery of Santa Maria, founded by Saint Nilus the Younger. Over the years this famous Byzantine-Greek monastery was known by many names, and finally settled on The Abbey of Santa Maria di Grottaferrata. The legend goes that at the spot where the Abbey now stands the Virgin Mary appeared and requested that Saint Nilus create a church in her honor. Today it is the last of the many Byzantine-Greek monasteries and the monks (Catholics of the Byzantine-Greek rite) follow the teachings of St. Nilus and St. Bartholomew and still live and work within these ancient walls. While in Grottaferrata take your time, be a slow traveler, and explore the area with its many interesting and antique sites such as Abbazia di San Nilo a Grottaferrata, Villa Aldobrandini, Palazzo Colonna, Frascati Cathedral, Tusculum, Lake Albano, and the Papal Palace of Castel Gandolfo. But especially go to nearby “Ostia” which is less than forty minutes away. Ostia was originally known for the salt flats along the Tiber River’s mouth (ostium) and the community harvested sea salt which was used as a food preservative… around 600 BC. In 400 BC, as the Roman Empire began to develop, they invaded Ostia and built a naval colony and fort to protect the Tiber River access to Rome which was nineteen miles upstream. As the Roman Empire came into its own, the enhanced seaport of Ostia became a very strategic as well as valuable asset. By AD 150 Rome controlled all of the Mediterranean and Ostia flourished as a very busy and prosperous commercial port. With the fall of the Roman Empire in the Fourth Century the port was abandoned and poverty and disease ravaged the city. A malaria epidemic swept through the city of over 100,000 residents and became a deserted ghost town which was eventually covered in silt as the Tiber River retreated from the coast line (Ostia is about two miles inland today). Ostia sat abandoned for centuries but the silt kept the buildings, streets, infrastructure, artifacts and history intact and to a certain degree protected it from the scavengers that went after the decorative marble stones and other valuable building materials for their own use or for sale. The city is well preserved and is, in fact, one of the most amazing archaeological sites in all of Italy. In addition to the architecture there are magnificent frescos and impressive mosaics that portray the wealth and prestige of this historic center. Amazing Archaeological Site and No Tourists! Slow travelers with inspired itineraries and a thirst for the unusual, venture to sites such as this… but not the “typical tourist”. You can take a commuter train from Rome Center, which is thirty minutes away, but it is not on most tourist’s destination list… what a shame! Here you can explore the remains of the city… the warehouses, apartments, mansions, baths, shopping arcades and get a “look” into how the Romans lived nearly two thousand years ago. It is as wonderful as the Forum and Pompeii… but no crowds! This side trip was inspired by asking three impeccably dressed Italians in an elevator about the local restaurant options. Independent travelers step out of their comfort zone… we encourage you to ask the questions and expand your knowledge. This entry was posted in Uncategorized on July 7, 2015 by Bob and Janice Kollar.